Make Architecture were engaged to renovate and extend this Victorian bungalow. 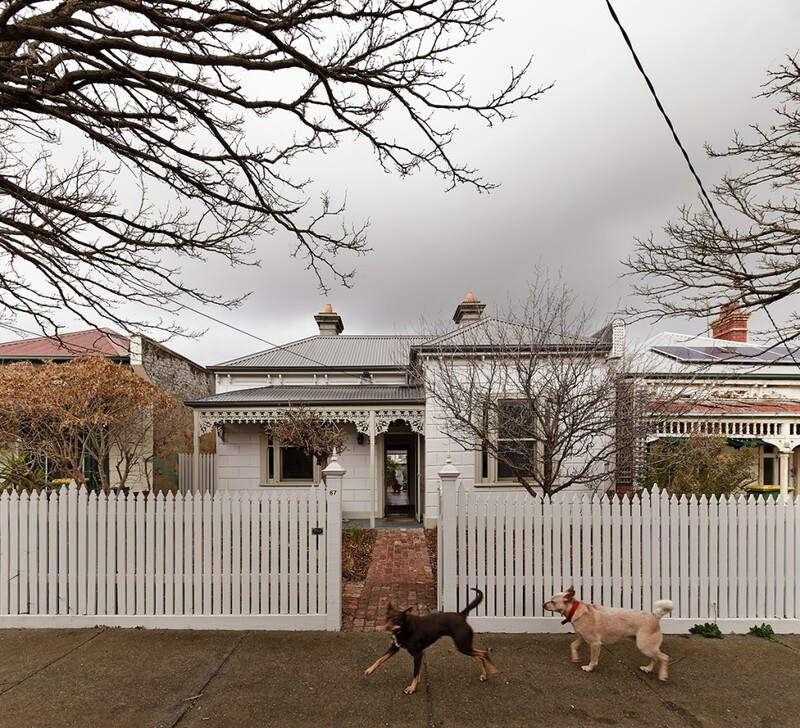 The façade of the house was tired and the back section of the house was quite dark, when the new owners bought the property, but they were inspired by the possibilities. With a north-south orientation, it was important for the new design to bring northern light into the rear living spaces. The new addition was kept as small as possible to retain as much of the generously sized backyard. The lean-to, that contained a bathroom, laundry and toilet, was demolished at the back. 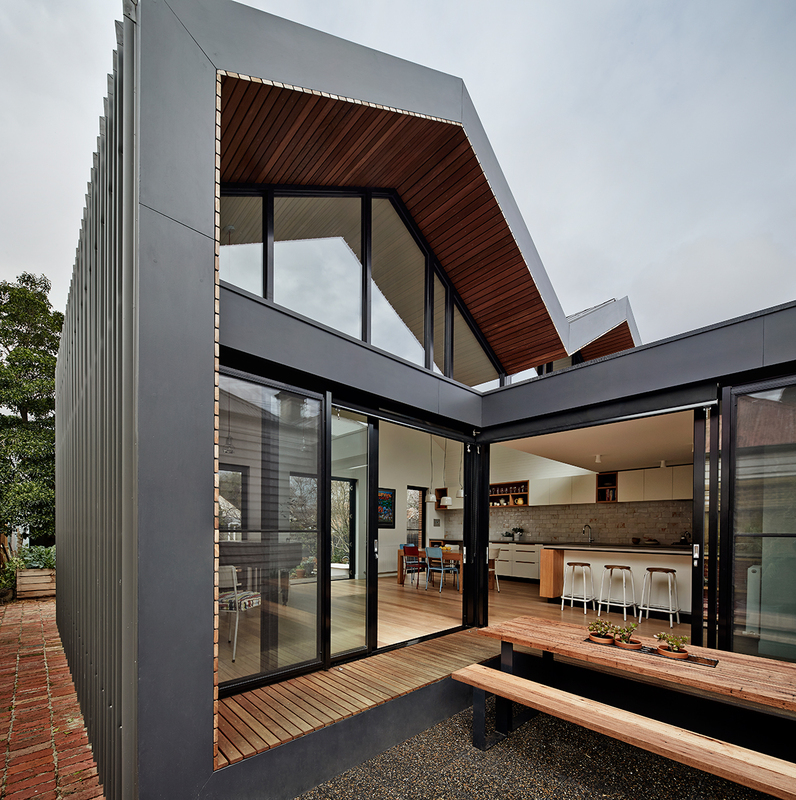 The new extension houses the kitchen, dinging and living spaces with a lowered courtyard. 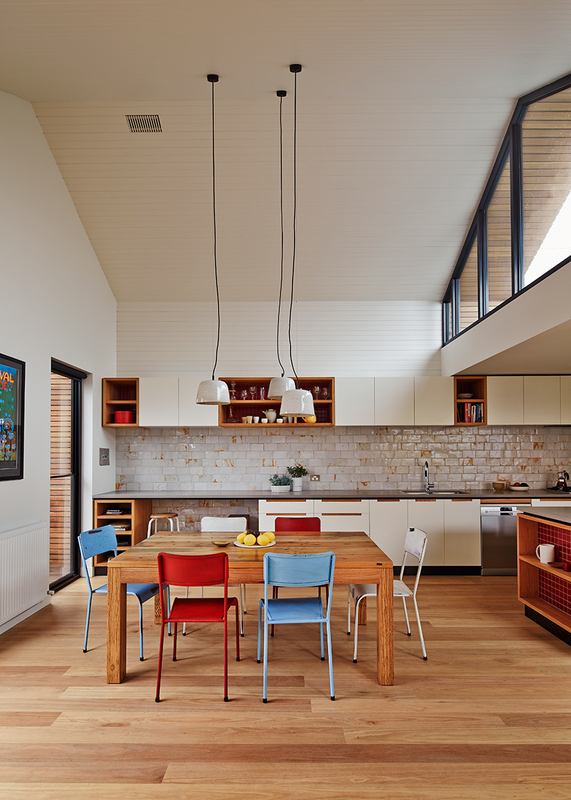 The existing three bedrooms and fireplaces were retained but refreshed and the old kitchen and lounge area continues as a lounge area for the evening. Two skylights have been added to draw light into the walled in space. Timber flooring runs throughout the house with a change in colour finish from dark to light emphasising the transition from old to new. 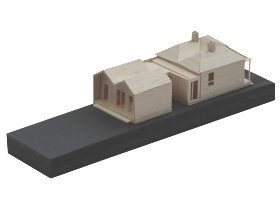 The double hip roof form of the existing house has been extended to the rear, with the new section sliced at either end. The living spaces now receives the much needed light in the winter and the deep timber lined eave protects it from the sun in summer. 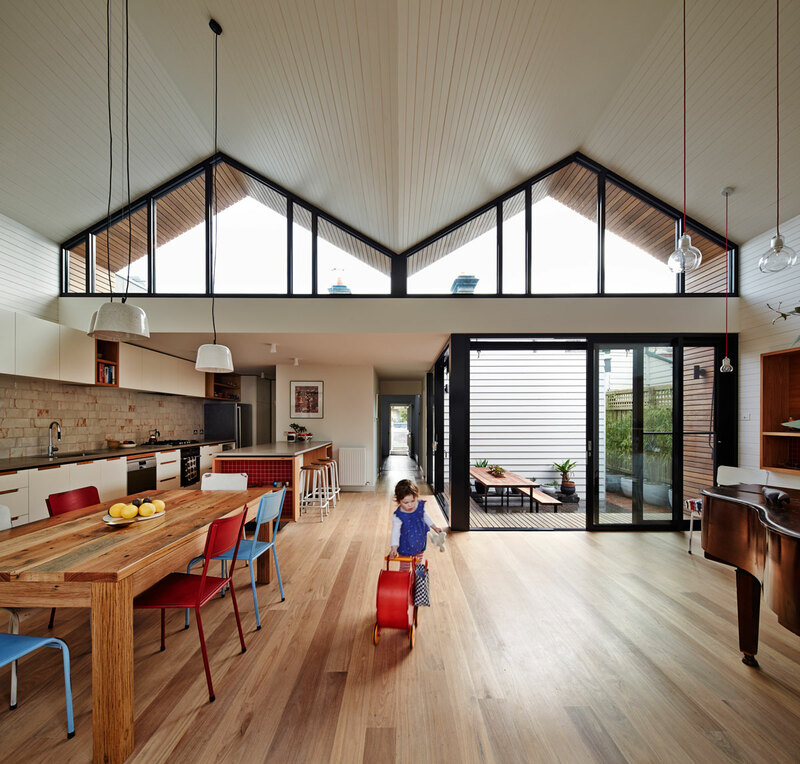 In the architect’s words “with its wrap around bench seat, the courtyard becomes an extension of the living space, allowing for family life and activities to spill outside when extra space is required.” The ‘M’ roof form is expressed internally to create expansive ceiling heights. 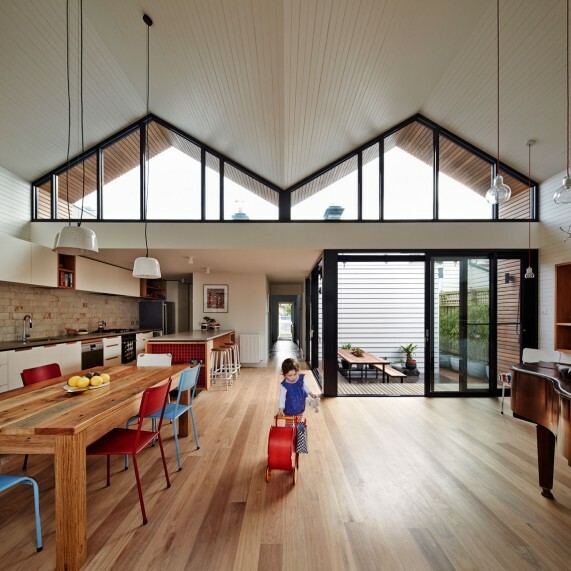 Lining boards painted white fold into the ceiling and appear to extend through the façade to become the external timber lining of the deep eaves and side walls. Home office space has been incorporated into the kitchen, and a piano that sat unused in an old spare room is now out in the main living space and is played regularly. The architect’s describes the sunken bath in the efficiently planned bathroom and the handmade tiles by MAKE’s Bruce Rowe, as “small moments of delight”.